Three butterfish, their fins removed in this picture, but still waiting to be cleaned, resting next to the sink on a sheet of parchment. They were beautiful, and they were delicious, but, note to self: I’m not likely to prepare them again. It’s about those bones. But now, as I continue working on this post the next afternoon, I’m thinking: They really were beautiful, and very tasty; maybe if I had a little more patience, and took a little more time with the fillet knife…? 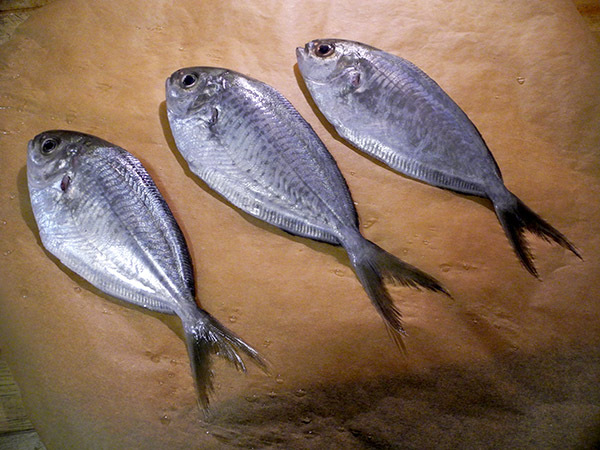 This picture shows what the butterfish looked like when they reached our ancient dining table. And this one includes, at the lower right of the second basket/tray from the bottom, the one-pound heirloom tomato which became a salsa all by itself. Barry was going to be in a Catskills wilderness from Wednesday through Friday, ‘camping out’ with his Artsy coworkers. I would have gone to the Union Square Greenmarket yesterday out of habit alone, but I also still wanted to eat well. More and more, for us, ‘eating well’ has come to mean seafood, so seafood it would be. Since I was going to be the only guest at the table, I decided to try to find something I hadn’t cooked before, something with which I might take a chance, exposing only myself to the possibility of failure. Blue Moon Fish had a few butterfish left when I got there at 11:30, a very few – one more than the two visible, in fact, once Margo had scooped through the ice to find the third. I had never cooked butterfish, but I was so excited with their simple beauty that I didn’t even think about the fact that they weren’t yet cleaned, and I also had no idea what I was going to do with them. There was also a certain amount of pride in buying my dinner, 11 ounces of whole fish, for only $2.25 ($3.50/lb) when some popular, premium species might sell for, . . . yup, up to seven times that price. Then there are those bones. I cut off their fins (not quite deeply enough, it turned out, in the case of the dorsal and ventral rows), gutted them (I was surprised at how tiny was the pocket occupied by the innards), keeping heads and tails intact with the bodies, washed them and returned them to the refrigerator, to turn to assembling a recipe I might use. I knew I might spend some time removing the fillets from the bone, so whatever vegetable accompaniment I selected would have to be happy sitting around for a while. 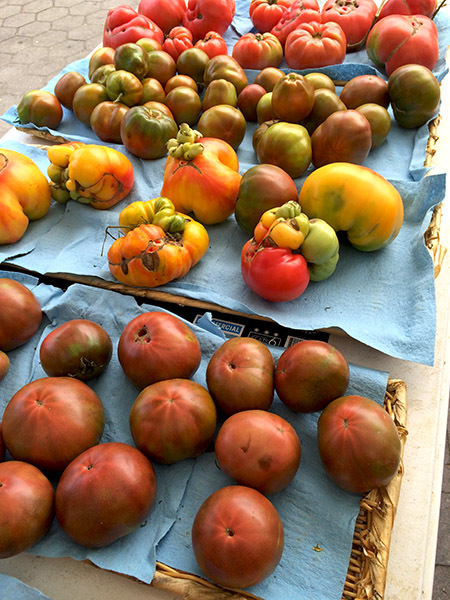 The decision to use a tomato salsa was more or less determined for me by the ripeness of a single large heirloom which had been sitting on our table for a few days. 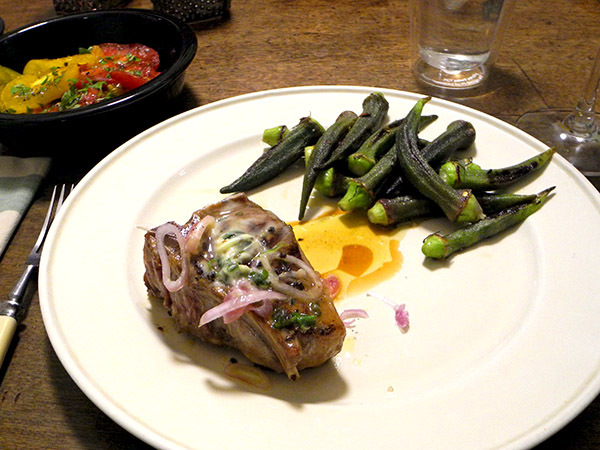 Note to self: The fish was astoundingly good, in both taste and texture, and the vegetables, which actually happened to be what I had on hand, excellent accompaniments. There really are other fish in the sea. And some of them are scrumptious. Please do not tell anyone about the ‘sea robin’, or ‘gurnard’, who might not discover this post on their own; its impecunious devotees might become very angry with me if the news of its virtues were broadcast too widely. This delicious, yet widely and unfairly disparaged fish, is incredibly tasty, very inexpensive, and, in our experience on this occasion at least, without bones. Found in abundance in seas from Southern New England and New York to Cape Hatteras, the species is among the least expensive, and apparently least endangered, of any of those harvested from our local waters; I can attest to their numbers anecdotally, having actually gone out into local coastal waters to pull in some cousins of theirs who are generally regarded as a far more desirable catch. Now I can also attest to their toothsomeness. The price of Sea Robin reflects its demand (pretty weak) and its supply (a seeming abundance). $5.45 was enough to bring home the six fillets, which weighed a total of about .82 pounds, an amount which worked out perfectly as portion for two. 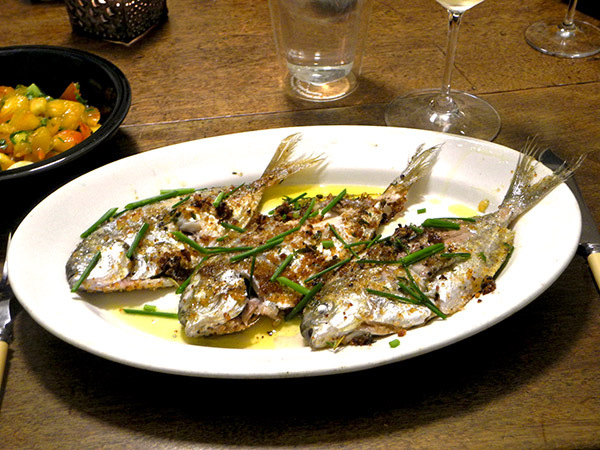 I found almost no information on their cooking (even Mark Bittman is silent on this species, in his book and anywhere else on line), but since our Sea Robin is related to the Mediterranean Rascasse, I searched under that name and came up with this recipe, for Rascasse à la tapenade. Since deciding to use it, I’ve come across a couple more, and I expect to take advantage of my new, small inspirational ‘index card’ recipe bounty following future visits to my local fish mongers. Note to self: This entire meal was a tasty delight, presumably as much for the quality of the ingredients as for the simple preparation, and accolades go to the modest cheese course as well (small portions of three cheeses, and some whole wheat toasts), which is not described here. At the Greenmarket on Saturday I tried to think of something with which the beautiful purple okra I had picked up earlier would be a good match. Then I was happily reminded that 3-Corner Field Farm was a part of the Union Square Greenmarket on that day. I bought a package of four thick loin chops, which were frozen. When I got home, I let them defrost just enough to separate the sections, so that I could place two chops in the freezer, and also two in the refrigerator, where they would defrost overnight. The entrée I put together the next day represented the fairly rare appearance of red meat on our table, especially in the summer, but this particular appearance was a very good one. 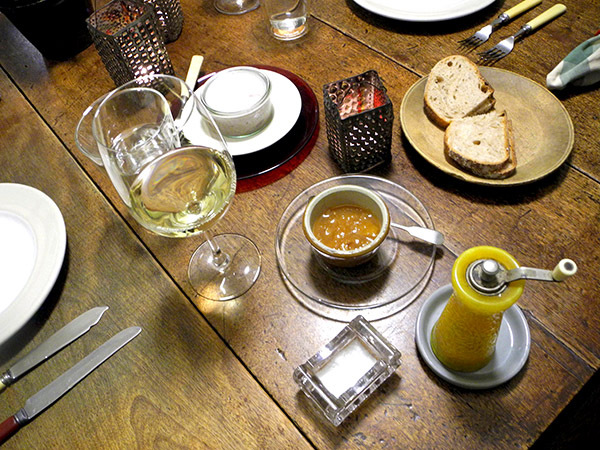 The first course, of rillettes, with a condiment, was the fruit of an impulse purchase. 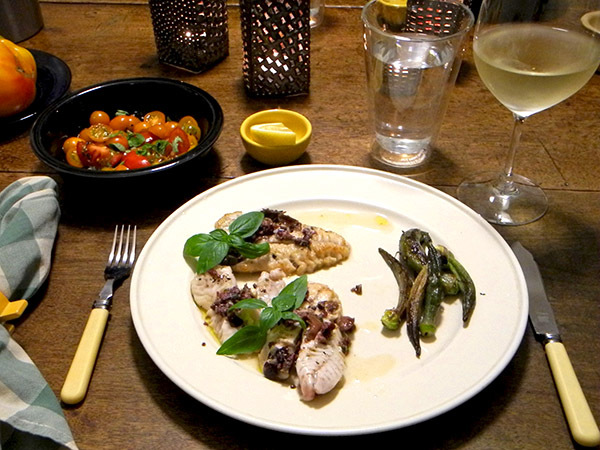 The hake appeared on the table on Saturday because we hadn’t enjoyed that noble fish in three months, and because I had spotted some very fresh-looking fillets at the Greenmarket earlier in the day. 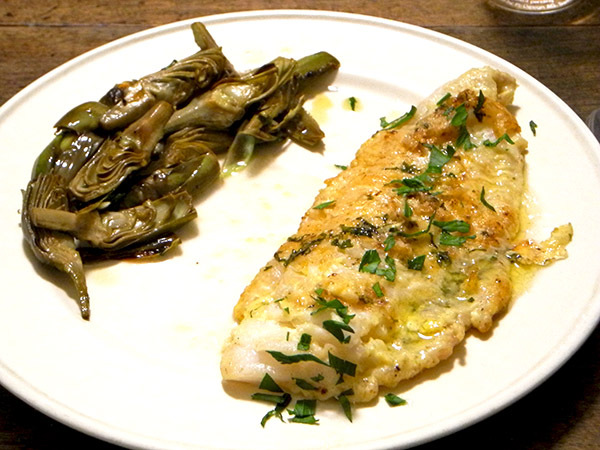 As I had once before, again trying to avoid turning on the oven on a summer evening, I used a recipe originally calling for cod, merluzzo dorato, I substituted hake (making it nasello dorato), as the two fish are very similar. It’s the late Kyle Phillips‘s terrific recipe. 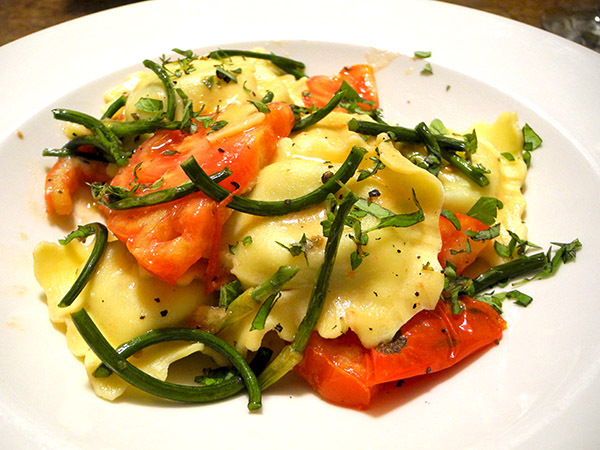 This meal was really tossed together in minutes. We had returned relatively late from an evening of David Moss and Harry Partch because afterward we visited with friends who were also in the audiences. Also, it was a ‘school night’, so we couldn’t eat as late as we might otherwise.